Krista + Derek are a fun, adventurous couple. 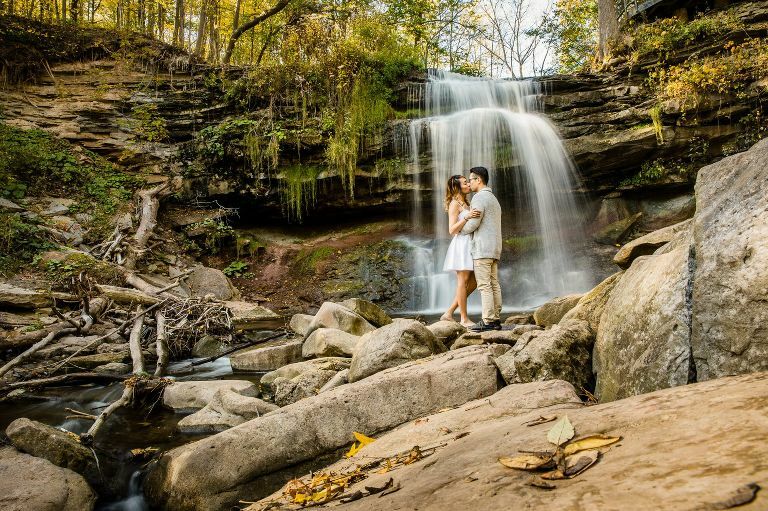 When I suggested the Smokey Hollow Waterfall as the spot for their engagement session they didn’t hesitate and had their hiking boots packed up and ready to go. It was a gorgeous sun filled day and as you can tell by my photography, I love environmental portraits. The tall trees with the greens and fall colours are gorgeous at this time of year and I think fall is becoming my favourite season because it’s just so darn beautiful! And let’s not forget the waterfall. It looked gorgeous at this time of year surrounded by the golden tones of this season. Here’s a couple of photos that I am really happy to share with you from Krista + Derek’s engagement.